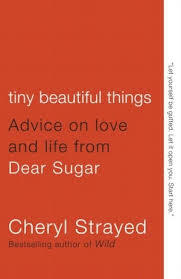 Right now, my go-to gift book is Tiny Beautiful Things by Cheryl Strayed. In fact, I don’t even have my own copy because every time I buy one, I just end up giving it away. If you haven’t read it, you should go buy it right now. And you should also buy a box of kleenex. And maybe a carton of ice cream or a box of donuts or something. Be prepared for all of the feels. Previous postBook Shame: Or, the Time I Brought Infinite Jest to the Beach. Oh my goodness, I love Sugar so much. I still haven’t read this book, but I used to read her column and I keep the Sugar Says poster hanging in my office. So, so good! I share your gift-giving dilemma. It seems like no matter what I select, when the recipient opens my gift, I feel like sticking my face in any nearby houseplant. Thanks for the suggestion.